The paths are rough in places with tree roots, stones and mud, so trail shoes with a good grip are a must. It’s an ideal course for a hard hill run with the long climb up Goauch Hill being a good place to test the legs and lungs! If you prefer a more comfortable run, then take it easy until the top of Goauch Hill, then enjoy the flatter and downhill sections where there are brilliant views of Scolty Hill and Deeside. The route begins from Scolty Forestry Commission car park. 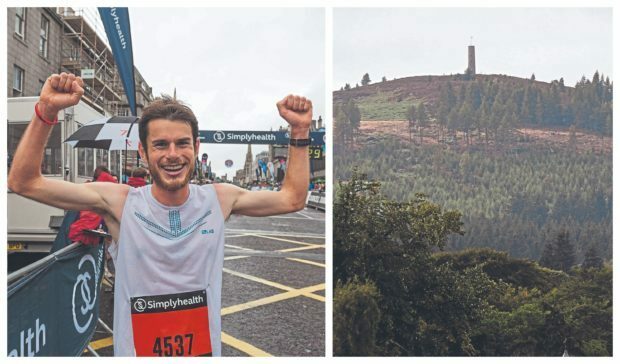 Starting from Banchory town centre adds an extra 3km in total and is a nice way to lengthen the run with some easier running to start and finish with. From the car park, take the immediate right turn on the single trail marked with the red signpost (this marker is for the March Trail loop). After the downhill section, you join the smoother forest track going left for a few hundred metres followed by a right turn then a left turn going slightly uphill – all of this is still following the red signposted route. As this short hill levels out, ignore the left turn on the March Trail and keep following the wider stony track gradually uphill and straight ahead as it crosses a burn. Another 200m after it bends to the right the second time, a steep single trail joins the track from the left – this is the main ascent path to Goauch Hill, the slightly higher neighbour to Scolty, which fewer people climb. It’s a lovely trail, soft underfoot and winding through the forest on pine needles and moss. It can be wet in the lower part after rain, and there are a few muddy sections, but it generally gets better as you climb higher. Often you’ll see deer around here and occasionally red squirrels. 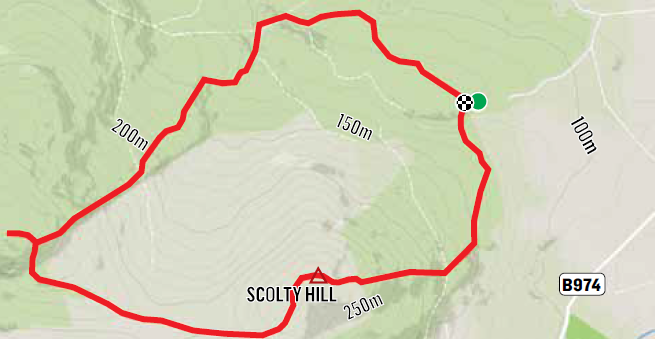 Map of the Goauch-Scolty loop, which begins from Scolty Forestry Commission car park. After roughly 800m of steady climbing, the trail joins a wider forest track where you turn left for 50m until it bends to the right and finishes by a stone dyke amongst the pine trees. Here you’ll see a soft dirt trail climbing up to the right hand side of the wall; this is our path for the second half of the Goauch ascent. Soon after a muddy section, the forest becomes brighter and more open with grasses, heather, blaeberry and thick mosses covering the rocky hillside. The climb steepens to make it the toughest section of the run; a bit of power walking might be just as quick as running at this stage. It’s best to stick to this trail until it eventually flattens out, still staying close to the wall, then look out for a well-defined trail leaving to the right to climb the last 100m to the summit cairn. The hilltop is scattered with old twisted Scots pine trees coated in mosses and lichens. The view may be restricted by these but the landscape is impressive and gives a very different feel from the busy Scolty hilltop nearby. The good news is you still get the Scolty views without much more climbing by following the trail across the open hillside between the two hills. The easiest way to Scolty is to retrace the path back down to the wall then cross the wall on the trail immediately in front, or turn right following the wall before finding another trail crossing to the left through the wall. These trails all link up as they cross a boggy section of heather as you head east (ESE to be exact) towards Scolty. This section of trail can be amazing on a dry clear day as you leave the trees and have the views towards Scolty and the Dee and Feugh valleys. After a downhill section it starts to climb gradually and you soon join one of the tracks going to the top of Scolty, taking a right turn and heading directly uphill on the wide grassy path. The path soon flattens off until you reach the summit tower and get the full view over lower Deeside and back towards Clachnaben and Mount Battock. There are many different paths which all go down to the car park, but one of the quieter ones goes directly east on a rocky trail through the heather to a gate after 300m. Once through the gate, go straight down following one of the many single trails used by mountain bikers. They are all steep but generally soft underfoot and pleasant to run down on a dry day. At the bottom, you cross straight over the wide forest track and follow the trail going downhill straight ahead, also marked with a red signpost. This is the other end of the march trail and leads you back to the car park after a gentle descent through the forest for another 1km. It’s ideal for running fast so is perfect for stretching out the legs before the end.